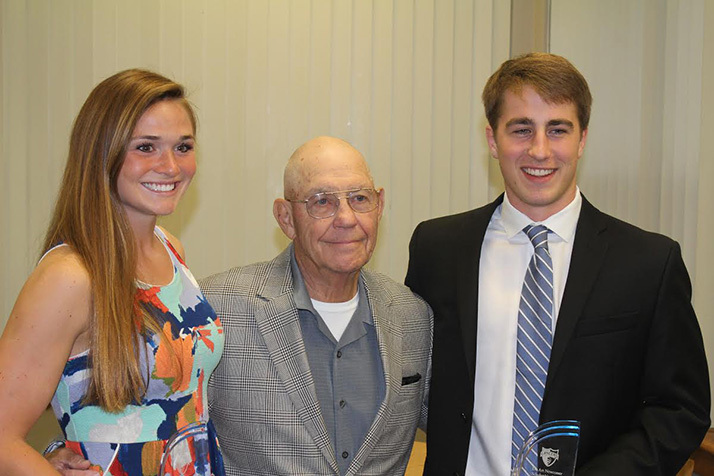 Dr. Art Newcomer (center) with 2015 Newcomer Scholarship winners Emma Braasch and Sam Huffman. Photo courtesy Andy Hendricks. Halftime of tonight’s Lancers varsity boys basketball game will feature the induction of the first-ever member of the SM East Athletic Hall of Fame. 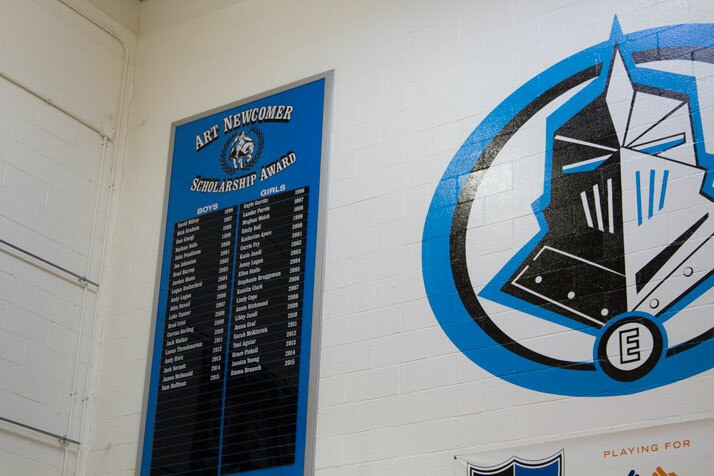 A board listing the recipients of the annual Art Newcomer Scholarships hangs in the SM East gym. Dr. Art Newcomer served as the school’s director of athletics from 1965 until his retirement in 1995, a tenure that saw the extensive expansion of sports programming at the school. When Newcomer arrived, SM East had just six varsity sports programs. When he left, the Lancers had 22 teams. He was one of the first high school athletic directors in the country to push varsity competition for girls under Title IX. Among his other lasting contributions to the SM East community, Newcomer was the founder of the Lancer Day Parade and of the school’s All-Sports Booster Club. His work was widely respected beyond the Shawnee Mission area, however. Newcomer was among the 11 founders of the National Interscholastic Athletic Administrators’ Association, and among the seven founders of the Kansas Interscholastic Athletic Administrators Association, where he has served on the board since 1969. Newcomer’s own experience with high school athletics propelled him to play college football at Bethany College, where he was a place kicker. He went on to earn a doctorate in education from the University of Kansas. He is the only person from Kansas ever inducted into the National Athletic Director Hall of Fame, and was named Kansas Athletic Director of the Year in 1978. Newcomer will be honored with induction into the SM East Hall of Fame at halftime of tonight’s game against Olathe East. Tip is at 7 p.m. in the SM East gymnasium.